Effective content marketing grows from a deep understanding of the competition we face for our audience’s attention. Efficiently choosing the best topics to write about can have a positive impact on ROI. We think that social shares are a great proxy for interest because they easily reflect what people find worthwhile and engaging. BuzzSumo’s Content Analyzer now offers an easy way to use social share data to compare up to 10 topics, quickly revealing which are more saturated with content and therefore competitive, and which have higher audience engagement. If you have two related topics in mind, write about the one that gets more average engagements on social media. You knew that already, though. 😊 The problem has always been in quickly sorting ideas to find the best of the best. Evaluating topics with their social data can be quickly accomplished with the Content Analyzer’s compare option. For example, if I am writing about nutrition or fitness, I might want to critique different diets. In this search for the terms “Paleo” and “Vegan,” it’s easy to see that content about Paleo eating is more popular. 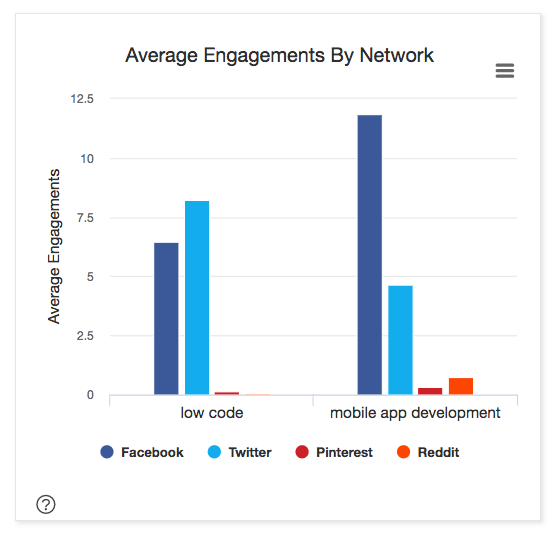 “Paleo” has a much higher average level of engagement. So, writing about it can give me a competitive edge, making it easier to get my audience interested in my content, and extending its reach with more social shares. This search took less than a minute, making the Content Analyzer an efficient choice for maximum ROI. Just as it can be wise to opt for long-tail keywords with lower competition instead of core keywords with tons of competition, using content marketing topics that meet your business goals AND are less competitive is a great option for maximum impact. For example, many people who are interested in content marketing are also interested in influencer marketing. A quick search comparing the two terms makes it immediately clear that there is less competition now for content about influencer marketing. I can now frame my content with an emphasis on how it relates to influencer marketing. Another option is to pursue different types of content based on how saturated or competitive the content landscape is. Some topics will have low competition because people are just not interested in them. Verify audience interest with your own industry knowledge and evaluation of average engagements. Mark Schaefer sums this up well. When we asked content marketing experts for advice on thriving in very competitive content landscapes, Andy Crestodina talked about the importance of looking for related topics. Blockchain tutorial is both low competition (409 articles this year) and high interest (average shares higher than blockchain alone), making it an outstanding choice for maximum efficiency, and ROI. Use Google’s related search suggestions — full disclosure, that’s how I found “Blockchain tutorial.” To find the related searches, scroll to the bottom of the first page of search results. Use Pinterest’s suggested searches. In this example, I’m intrigued by the idea of blockchain use cases. 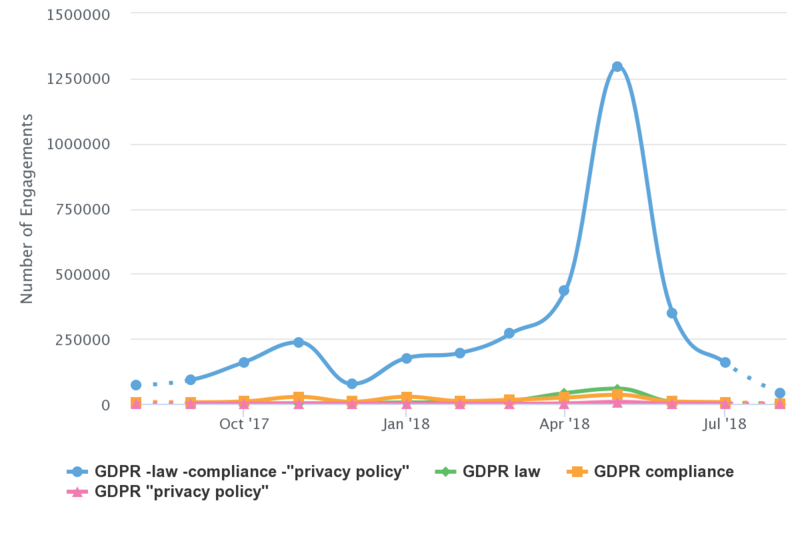 Using the comparison tool, I can quickly determine that GDPR law is the most engaging of these topics. Social networks are where conversations take place on different topics. In most content areas, the conversation will gravitate toward one network over another. By comparing the performance of different topics by network, you can develop content that will appeal to target audiences on specific networks. Another way to use term comparisons for social networks is to promote content differently based on topical preferences. For example, if I have an article about low code, I could create an ad on Facebook for people who are interested in mobile app development–these same ads will also be used in Instagram. Or, I could use the term mobile app development in the Facebook post, then link to the article about low code. Sometimes the terms that we use change more quickly than the ideas behind them. In those cases, it can be efficient and effective to dust off older content and reframe or repurpose it in light of new, engaging content topics. For example, there are key similarities between interactive content and experiential marketing. In some ways, one is an outgrowth or development of the other. 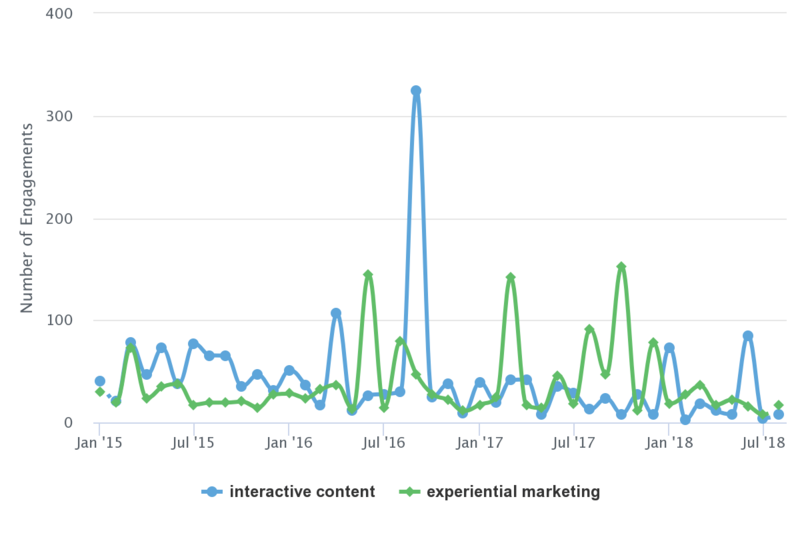 Notice how posts about interactive content performed well in 2015 and 2016, but posts about experiential marketing are doing better in 2017 and 2018. A post about interactive content might be able to be reframed and republished to reflect newer, more engaging topics. We’re very excited to have topic comparisons available in content analysis. We’d love to hear from you if you come up with a way to use them that we haven’t thought of yet!